What's New in Sage 200 2016? 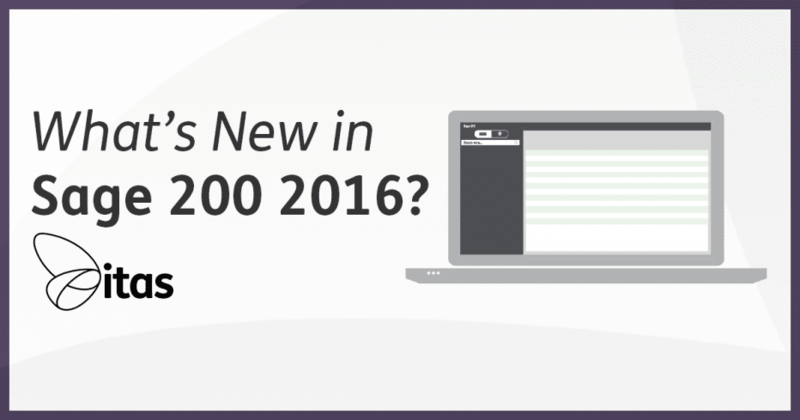 What’s New in Sage 200 2016? As you may or may not be aware, the hotly anticipated Sage 200 2016 was released Monday 23rd May. Being a Sage 200 business partner, we got a sneak peek at the new product prior to it’s release, allowing us to let you know whether it is worth investing in. This blog details some of the new features of Sage 200 2016 along with customer experience improvements and usability enhancements. Now that’s a mouth-full. Sage Payments is the new, easy and secure way to pay your suppliers and HMRC directly from both Sage 200 Extra and Sage 200 Extra Online. So how does it work I hear you ask? Well the way it works is you add funds to your Sage Payments account, then use those funds to pay your suppliers or HMRC directly from the software. In order to use Sage Payments you need to apply for an account. Once successful, you set up Sage Payments via the website using your already existing Sage credentials. Sage Payments uses multiple security methods to ensure that your accounts are safe. You will need a secure 6 digit pin to enter your account, which you receive once you sign up to Sage Payments. Within the Sage Payments Website itself, you can add users to the account. Once users are added, you can then give them certain permissions, such as which companies they can see and whether they can approve payments and/or have admin rights. For more information on Sage Payments, see Episode Nineteen – FAQs on Payment Processing. Within Sage 200 you have an easily accessible Sage Payments dashboard, here you can set up which suppliers can be used with Sage Payments and see an overview of your payments progress. It shows details on payments that have been approved, rejected or are awaiting a response. An extra layer of security is added to Sage Payments, when approving a supplier you are sent another 6 digit number via your mobile phone, which you need to submit in order to make any progress. Subsequently, each user is linked with a mobile number in order to ensure maximum security. A final feature of Sage payments is within Sage 200 itself. When using the Suppliers List, there is a new column included called Sage Payments Status. This allows users to see whether the status of the supplier has changed and can be shown as Approved, On-Hold, Denied or Not Submitted to Sage Payments. This is a big feature in Sage 200 2016, eliminating the use of a paper statement when reconciling in Sage 200. Bank Feeds allows you to download live bank account transactions and compare them to your Sage 200 transactions. This in turn means you have the ability to match your bank transactions to those in Sage 200. It simplifies your bank reconciliation and ensures your accounts are up to date and more importantly, accurate. Within Sage 200, the Bank Feed is essentially a split screen with a feed from your bank account on one side and your transactions on the other, this allows you to view both sides simultaneously. But before you get too excited, it is worth mentioning that Bank Feeds is part of the Sage 200 Services add-on, meaning that you can’t get access if you don’t have the add-on. You must also check that your bank account is compatible with Bank Feed. Sage Pay already exists in Sage 200, however it has been improved. You can now add a ‘Pay Now’ buttons to your invoices, statements and letters. This allows customers to pay instantly online by debit, credit card and PayPal. Payments are extremely secure, using the highest levels of security to ensure your customers details are safe. A bonus feature of the new and improved Sage Pay is the ability to send an emailed invoice with a ‘Pay Now’ button on it. The pay now button takes the customer to Sage Pay and gives them the ability to pay there and then. Commitment Reporting is the ability to use live purchase order costs in reporting and comparing to budgets. Industries such as Schools often need commitment reporting to compare to a budget for a department and will therefore benefit from this improvement. Any company that uses budgets may require a comparison of actual values, these can include costs they’ve committed to making, these companies would also benefit from Commitment Reporting. You can now group your budgets by report category and track the information in the program or in the workplace. You can then view the information in the work-space, ‘Nominal report categories’. This increases options for you to get more information out of the budgeting. As we spoke about earlier in the Bank Feed section, the Bank Reconciliation Screen has also improved. I won’t go into too much detail, but if you’ve forgotten, see above. Just to remind you, it is significantly easier to use and boasts a new split screen to help users confirm reconciled selections. Within Sage 200 2016 you are now able to create a sales return based on a sales order. Improvements such as the ability to copy returned orders is a great bonus feature of the new release of Sage 200. Sage creates a return for you when a customer returns a product, meaning you no longer have to do this manually, saving you time and effort! You can now override negative stock options in rapid order entry for allocation of stock in Sage 200. This is another exciting feature, and along with the new predictive text in Rapid Sales Order Entry, order entries will be sped up and more streamline than ever. Stock Analysis allows for improved reporting and enquiries for stock control allows for a greater depth of analysis in Sage 200 2016. In Sage 200 2016, Stock records have been extended to include a massive 20 analysis codes. Now allowing customers to capture more data against individual stock records than ever before. Stock records have also been extended to include a barcode section, they are printed in code 39 format. Cheque printing has improved. Now giving users the ability to print off cheques at the same time as saving a nominal payment. Now, you can control the default of this option within the nominal ledger settings. Improvements to the Price Book include the option for customers to select which stock items to include in which price bands. This eliminates the tedious task of adding the stock items and removing ones that aren’t relevant to the price band. You can also create limited price bands, and flag them as active or inactive. Finally, limited price bands can now have a duration, including a from and to time and date. Finally… you can import structure for stock items, this has been extended to support barcodes and stock analysis codes. So what do you think about Sage 200 2016? We do hope you are excited with all of these new features in Sage 200 2016, because we are! Are you wanting to upgrade your current system? Or do you have any questions about any of the new features in Sage 200 2016? Home » Sage Blog » All Sage Blog Posts » What’s New in Sage 200 2016?